Our award-winning maritime injury trial lawyers are well-known and respected for their work representing fish processors injured in Alaska, the Bering Sea, the Gulf of Alaska, Puget Sound, off the Oregon and Washington coasts, and other fishing grounds. For decades, we have successfully represented injured fish processors against some of the largest fishing companies in the world. We offer a free consultation to injured fish processors. Contact us today for your free case evaluation at 206.624.8844. 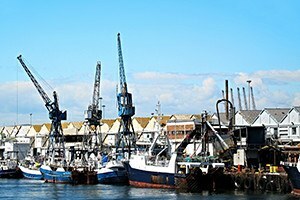 Over the years, our fish processing injury lawyers have handled a variety of claims for fish processors injured on factory trawlers, during offloading the vessel, and on processing barges. Common causes of injuries on factory trawlers include: slips and falls on unsafe deck conditions, amputations due to unguarded equipment, injuries due to excessive lifting or unsafe lifting practices, injuries from falling objects, injuries from crew assaults, injuries from falling from height, injuries from failure to require personal protective equipment, injuries from being struck with objects, injuries from the swinging load of a crane, and many others. Because of the long hours, heavy work, and unsafe conditions that are common to the commercial fishing industry, processors can sustain back injuries, injuries to their knees and shoulders, and other severe injuries that may limit their ability to continue in heavy work. Having handled many cases against fish processing companies, we understand that nature of the work and how to best prosecute these claims. Jobs in the fish processing industry involve long hours (16 hour days, seven days a week) with little sleep under unsafe conditions with moving vessels, moving equipment, and heavy lifting on slippery decks. When an injury occurs, the circumstances of the injury must be evaluated by an experienced maritime injury lawyer to determine whether a claim exists under the Jones Act for negligence against the employer or whether an unseaworthy condition caused the injury. Many factory trawlers are not properly set up to limit injuries to fish processing workers and unsafe conditions are allowed to persist so that the company can maximize profits. Over the years, our maritime injury lawyers have collected millions of dollars for injured fish processors, deckhands, and other workers on factory trawlers and processing barges. Under general maritime law and the Jones Act, an injured fish processor may collect damages for lost wages, economic losses, loss of earning capacity, pain, disability, loss of enjoyment of life, and other damages that depend on the circumstances. If you have questions about the types of damages or compensation you may claim, contact one of our experienced maritime injury lawyers today for a free consultation at 206.624.8844. At Kraft Davies, PLLC, we know the fishing industry. Our Seattle fish processor injury lawyers are well-prepared to act as your strong advocate before your employer, your employer's insurance company, equipment manufacturers and their insurers or any liable party. Most cases settle, but we have found over the years that the best compensation is paid on claims when the lawyers and their clients are prepared and willing to take a case to trial. It is only when a case is well prepared and a high verdict is likely, that a fishing company will pay a substantial settlement. For more information or to schedule an appointment with an experienced attorney regarding a case involving commercial fishing vessels, crab boats or fish-processing trawlers, please contact us or call 206.624.8844 for a free initial consultation.